Synthol or “site enhancement oil” is a sterilized MCT oil that consists of 85% oil, 7.5% Lidocaine (pain killer), and 7.5% alcohol. Synthol is a readily available product on the internet, prices are varied. Synthol is used to enhance the appearance of muscles. It is sometimes used by professional bodybuilders to inject into weaker or imbalanced muscles to give instant size. Essentially, Synthol works as a synthetic oil implant. The most common muscle groups in which Synthol is utilized, is in smaller muscles such as the biceps, triceps and calves. In extreme cases, one may even inject Synthol into the shoulders and chest.Many regard using Synthol as “cheating” as no hard training or dieting is required to actually gain size in any one muscle group, just inject and appear instantly bigger. The argument against Synthol, is that although the use of anabolic steroids does assist in adding slabs of muscle mass, one must still work incredibly hard to make sufficient gains. Without anabolic steroids and hard training, it would be near impossible to sport a 20 inch set of arms, however, Synthol does give the user the ability to go from a natural 16-18 inch arm to a freakishly large and bloated 20-23 inch set of guns in a matter of weeks. No muscle growth takes place, however, only an accumulation of oil within pockets in the muscle. The physical appearance achieved through the use of Synthol is not very aesthetically pleasing. To some degree, “disgusting”. As a result of injecting Synthol, the end result is often what looks like an unnatural mutation in the arms or shoulders, covered in lumps and bumps. It’s very hard to fool people into believing it is 100% natural muscle due to the fake, lumpy and puffy look that it induces in the muscle. It is unknown just how long Synthol will last within a muscle more research is yet to be conducted on this subject. 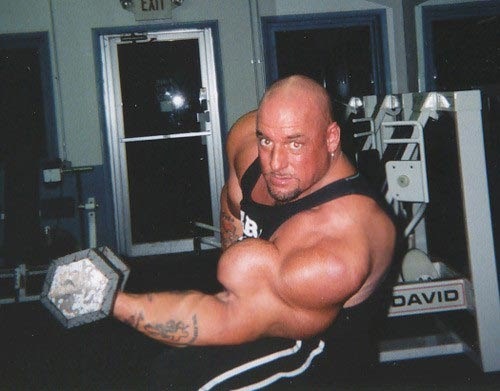 A famous Synthol abuser well known and somewhat hated in the bodybuilding community, is Gregg Valentino. He has denied that his unnaturally and mutated looking arms contain Synthol, but that they are the product of injecting thousands of millilitres of steroids over many years. Aesthetically speaking, Synthol will do nothing but have you ridiculed and taunted by others who can see that your muscles aren’t actually real muscles, rather a build up of oil stored within pockets in the muscle. The girls will not be impressed if you sport a set of arms that look like a lumpy sack of potatoes. There is no simple or easy alternative to building natural lean muscle mass, it takes time, hard work and dedication.